Our fall events are back and in full swing. Not only are we hosting an event on the 12th but we are hosting another just a few days later. 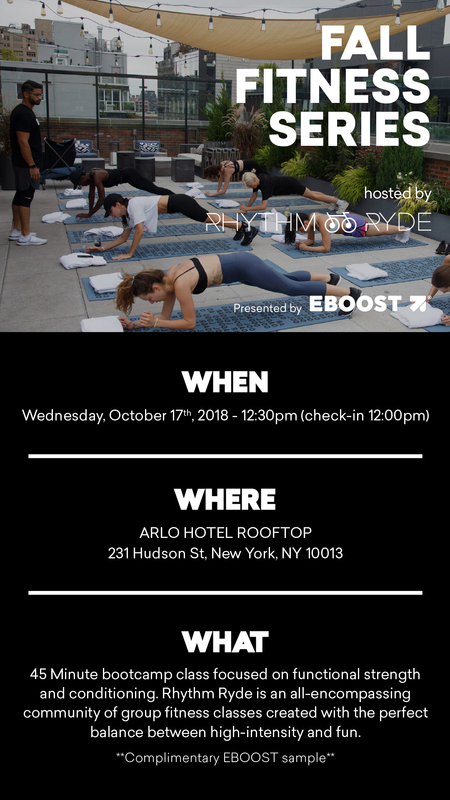 Join us for our Fall Fitness Series of workouts at the Arlo Hotel rooftop! This workout is a FREE event and all about catching a workout during your lunch hour. Get ready to get sweaty! A workout hosted by Rhythm Ride. A 45-minute bootcamp class focused on functional strength and conditioning. Rhythm Ryde is an all-encompassing community of group fitness classes created with the perfect balance between high-intensity and fun. Of course, it wouldn’t be an event co-hosted by us without bringing any of our goodies. Expect there to be complimentary samples of our EBOOST products during the events too! Even though this event is free, we ask you to RSVP here as there is limited space on the rooftop of the Arlo Hotel.